Wings Spirit: Hum, hum, hum! Before finishing up my remaining two posts of "Underneath Spanish Moss", I would like to share with you my all time favorite, Ruby-throated Hummingbird! If you follow my posts, you probably already know hummingbird was the bird that brought me into the wonderful world of birding. Hummer is also the bird that inspires me to start writing WingsSpirit and motivates me to learn photography to preserve avian's beauty. 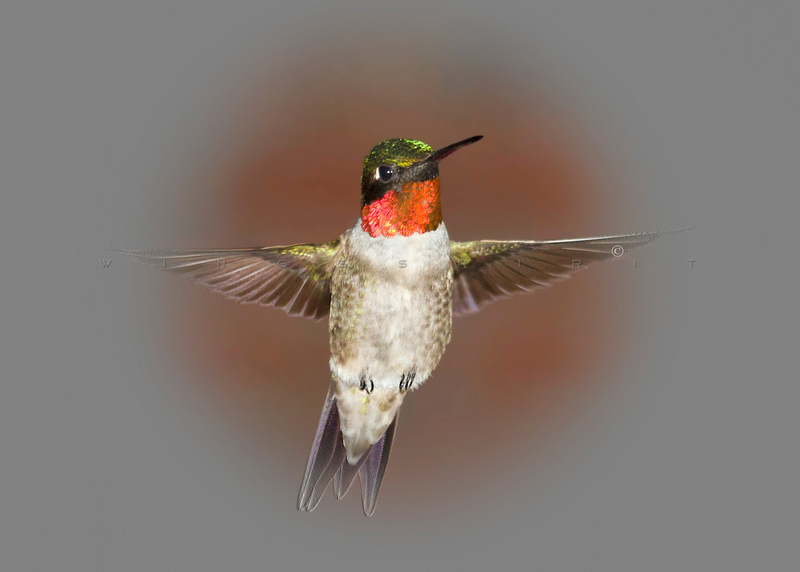 Male Ruby-throated Hummingbird ...click image to enlarge. Thanks Pekka! It's not the best shot but I have no complain :) As you chase treasure, I chase hummers. Working on some technical issues so hopefully I can get another pose, you will see it!